There were over 18 million people playing tennis in the U.S. in 2016, the highest figure since 2010. About 345 thousand students played tennis in high school in 2016/17, of which a slightly higher share was female. One of the most successful professional tennis players of all time is Roger Federer. The Swiss-born player is the world’s highest-paid tennis player, as he made about 64 million U.S. dollars from endorsement deals and earned six million U.S. dollars in prize money between June 2016 and June 2017. Serbian athlete Novak Djokovic ranked second in income among tennis players, receiving 47.2 million U.S. dollars during the same time frame. Federer is also the leading male player in regards to career earnings, with more than 111 million U.S. dollars in career prize money. Serena Williams is the best-paid female tennis player, with total career earnings exceeding 84 million U.S. dollars. The Grand Slam tournaments – Australian Open, French Open (also known as Roland Garros), Wimbledon and US Open – are the four most important and prestigious annual tennis events for both men and women. The Australian Open is the first major of the year, taking place in mid-January, followed by the French Open in May/June. Wimbledon, the only of the four majors to be played on grass, takes place in June/July, and the Grand Slam seasons finishes with the US Open played in August/September. 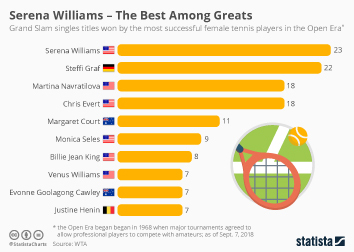 Roger Federer is the male tennis player with the most Grand Slam titles, 20 as of May 2018, whereas Serena Williams leads the female players with 23 Grand Slam tournament titles.